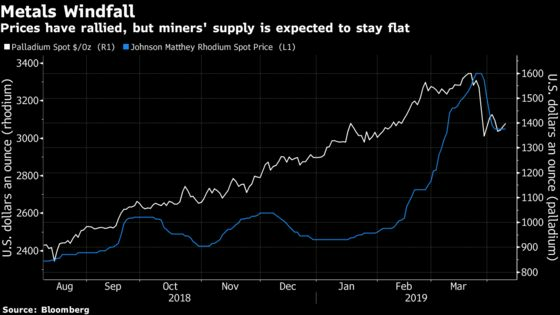 (Bloomberg) -- The recent jump in platinum-group metals prices is boosting miners’ profits, but that doesn’t mean they are likely to increase supply anytime soon, according to the world’s No. 1 producer. Prices for platinum, palladium and rhodium have all gained in recent months, boosting earnings for miners in top supplier South Africa. The so-called rand basket price for the industry has increased by 20 to 25 percent this year, said Anglo American Platinum Ltd. Chief Executive Officer Chris Griffith. Still, new supply will be limited. It takes five to seven years to open a new mine from scratch and there are other constraints to consider like processing capacity and the availability of water, the CEO said in an interview. While there are some expansion projects underway, that supply is already accounted for in market estimates, he said. Any new production will probably replace declines elsewhere, rather than expanding total supply, which is forecast to remain flat over the next decade, Griffith said. Amplats, as the company is known, is studying plans to boost its own production by expanding its flagship Mogalakwena mine. As well as other constraints such as water, there’s very little spare processing capacity in the country, he said. The company estimates that it will probably take 18 to 20 months before carmakers start substituting platinum in for pricier palladium in their autocatalysts, the CEO said.